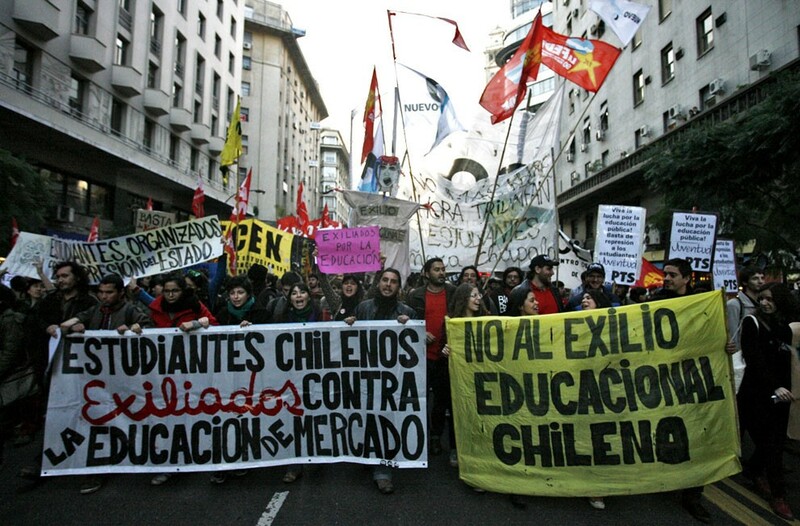 Over the past few weeks, Chilean students in major cities, including Santiago, Valparaiso, Concepción, and Temuco, have returned to the streets in full force in order to protest recent changes implemented by the Education Ministry and demand “free education for all.”  The dramatic protests, which began back in early April, highlight the extreme discontent in regards to Chile’s entire approach to the education sector. Chile has one of the most privatized education systems in the world, and frustration has reached a boiling point. Chile first implemented drastic changes to its public school system during the rise of Augusto Pinochet, who overthrew the socialist administration of former President Salvador Allende in 1973. Under Pinochet, a neoliberal economic agenda was enacted in which large sectors of Chile’s economy were privatized. University funding declined, because the dictator viewed universities as potential sources of dissent, and schools were forced to raise tuition rates and cut the number of students accepted. In 1981, Pinochet enacted sweeping education reforms that called for greater autonomy to regional campuses and encouraged the establishment of private universities. Under his regime, 38 private institutions were founded. Primary and secondary schools were also severely decentralized. Chile’s return to democracy in 1990 was unfortunately marked by little change in funding levels for its public schools and universities. A 2011 study by Libertad y Desarrollo indicated that welfare programs such as unemployment benefits, housing programs, and social security entitlements receive the most funding out of all areas of social investment. The privatization of many of Chile’s institutions of higher education has resulted in widespread inequality in terms of students’ access to a quality education. While middle-class students can afford to attend Chile’s more prestigious schools, disadvantaged students tend to solely have access to the under-funded state public schools. Student movements such as CONFECH (the Confederation of Chilean Students) and Mesup (the Student Federation of Private Universities) have joined forces with Chile’s largest teachers’ union, the CPC (Colegio de Profesores de Chile), to demand free, public education for all students across a wide array of socioeconomic classes. There is also much discontent expressed after the announcement this week by the Education Ministry that economic qualifications for student grant eligibility will change. While government sources claim that the grant adjustments will only affect 200 or so students, a report released by the Direction of Student Affairs (Red Daes) suggests that up to 10,000 students may be at risk of losing their government grants due to these new conditions. Chile’s conservative President Sebastián Piñera has expressed little sympathy with the student movements in the past. On August 11, 2011, he stated, “We all want education, healthcare, and many more things for free, but I want to remind them that nothing is free in this life. Someone has to pay.”  Piñera clearly is not considering the possibility that the government could pay for education. In an interview with Democracy Now on October 17, 2012, Camila Vallejo, a leader of the University of Chile Student Federation, responded to Piñera’s comment by suggesting that Chile reform its tax system: “Currently, large corporations and enterprises pay very little, if any, taxes, and we proposed a plan that would change the tax structure so that this education could be financed and financed by those who have more.”  Piñera will not be taking part in the upcoming presidential elections this November as he is constitutionally banned from running for a consecutive term. Michelle Bachelet, a likely frontrunner on the Concertación coalition ticket, promises to reform the system: “We must guarantee everyone a public education system that integrates them at all levels, takes the profit motive out of the system, and advances toward universal, free access.”  Though Bachelet’s words sound promising, it should be noted that she failed to enact serious reform during her previous presidency, which witnessed the 2006 student protests. 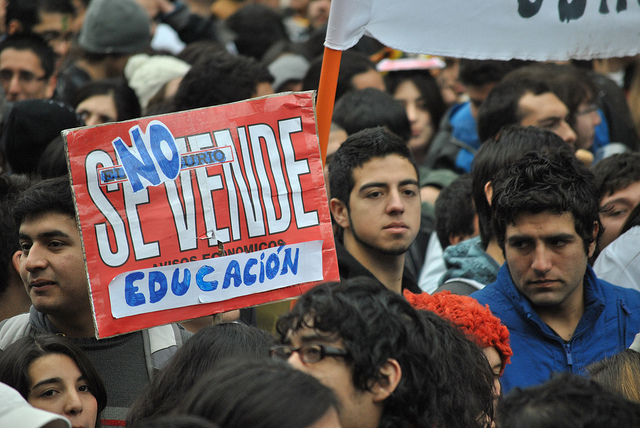 In order to quell protests and satisfy both students and teachers, Chilean authorities will have to reject the principle of education for profit, and recognize the fundamental societal right to be educated. Adam Smith’s principle of the invisible hand simply does not function when applied to education; the Chilean government needs to provide students with free, quality education at all levels so as to best guarantee fair access and promote a more equal society—this, or more turbulence and protests. Edwards, Sam. “Chilean Students Stick to Demands, Prepare to March Wednesday.” The Santiago Times, May 7, 2013. http://www.santiagotimes.cl/chile/education/26112-chilean-students-stick-to-demands-prepare-to-march-wednesday. Goldman, Francisco. “Camila Vallejo, the World’s Most Glamorous Revolutionary.” The New York Times, April 5, 2012. http://www.nytimes.com/2012/04/08/magazine/camila-vallejo-the-worlds-most-glamorous-revolutionary.html?pagewanted=all&_r=0. Camila, Vallejo. “Part Two: Camila Vallejo & Noam Titelman on Massive Student Protests, Post-Pinochet Chile.” Democracy Now!, October 17, 2012. May 23, 2013. http://www.democracynow.org/blog/2012/10/17/part_two_camila_vallejo_noam_titelman_on_massive_chilean_student_protests_post_pinochet_chile. Farbman, Jason. “Back to the Streets in Chile.” Socialist Worker, April 18, 2013. http://socialistworker.org/2013/04/18/back-to-the-streets-in-chile.